A tour that will show you every important attraction of Acapulco. 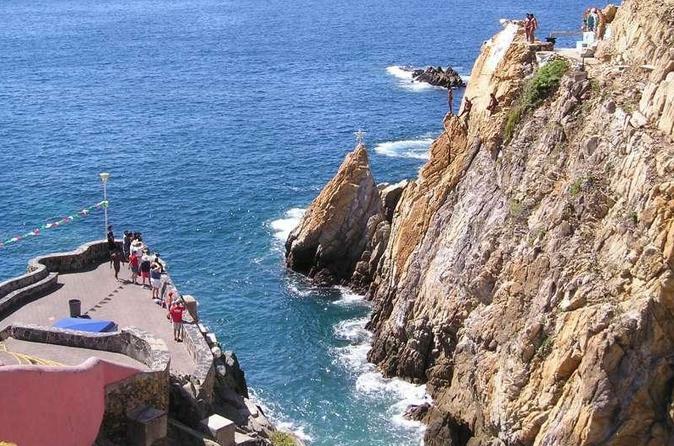 Admire the famous Divers of La Quebrada; the new and the old Acapulco, one of the most beautiful bays in the world and the Acapulco Diamante Sector, and the very pricey residential area of Las Brisas. The tour will stop for shopping, view points in north, east and west parts of the city. Your friendly English speaking guide will drive you by the Costera , passing by the Chapel of Peace located on the east coast of Acapulco and in the middle of the most exclusive, not to mention very wealthy residential area of the city. After a visit of 30 minutes the tour will continue to Costa Azul a typical middle class neighborhood of Acapulco. Afterwards, there will be a picture stop in the northern part of the city. The tour will continue in the downtown and La Quebrada area where you will see the high cliff diving exhibition . After the exhibition, you will also visit a silver shop nearby. Later the tour will make one more stop for pictures at the Casa Blanca Hotel. You will then visit the mural of the famous and most important painter of Mexico Diego Rivera. The tour will end at the cruise pier where you will be dropped off.